It did look like the market was in bearish transition, but like I said in the linked article, “Watch for a breakdown from these daily support levels as confirmation of the reversal action on the weekly chart.” Confirmation is crucial in technical trading. 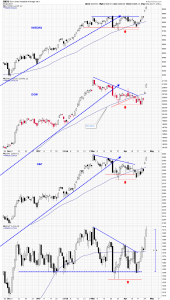 The Dow Jones Industrial Average was testing the support line of a horizontal channel consolidation and the S&P 500, the NASDAQ Composite, and the Russell 2000 Small-Cap Index we’ll all making lower highs above static support. Those support levels were under pressure and all indications pointed to a break down, but confirmation was crucial. As it turned out, support held and the indices bounced hard, taking out their overhead resistance levels. The Russell 2000 was up nearly 5% since it bounced off support and the other indices have either made or are near new all-time highs. It is difficult to say whether this is the start of a second phase of the rally that began in November 2016 or if this unusual movement will just as suddenly fade, and a different pattern of consolidation will begin. 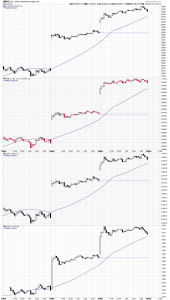 One curious pattern evident on the intraday charts is the way the indices have gapped higher at the open the last two days, and then traded sideways for the rest of the session. Is this evidence of the over influence of the overnight futures, or the strength in the European markets, or of algorithmic trading? That is unknown and unimportant to a technical trader — what the charts are saying is most important, and right now that message is unclear. New support and resistance levels and/or trend lines will have to emerge before the recent volatile price action can be put in context.